One of the largest banks in the world says choosing not to invest in renewable energy and divest from fossil fuel might come at a huge cost. Up to $1.8 trillion through 2040 or $44 trillion by 2060, when compared to the business-as-usual model. At first glance, you’d think health benefits or dodging collateral damage at the hand of cataclysmic events would comprise the bulk of the saving. In fact, what CitiBank analysts found is that the global economy might fail to capitalize a real-growth opportunity. It’s not about the savings. Lost earnings is the main factor that the analysts identified in their comparison model. More specifically, two scenarios were assumed: 1) decarbonizing the atmosphere to the point where a 2 degrees Celsius warming past pre-industrial levels should be avoided and 2) business-as-usual, which translates in inaction. Maybe most striking is that the cost of investing (costs of ditching fossil included, for instance) in either of the two scenarios is more or less the same. The added benefits, however, are worlds apart. 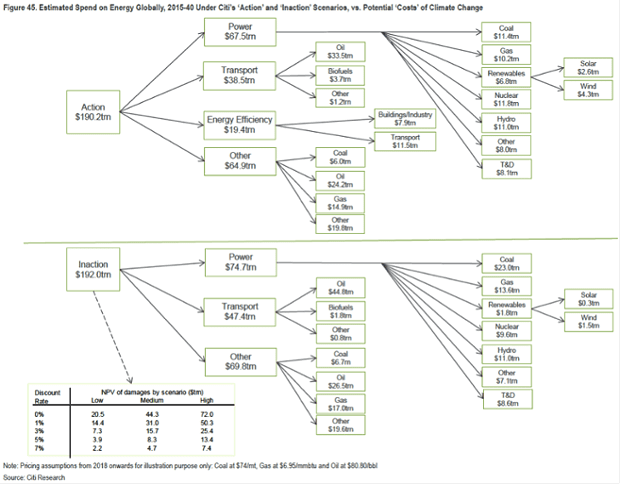 “What is perhaps most surprising is that looking at the potential total spend on energy over the next quarter century, on an undiscounted basis the cost of following a low carbon route at $190.2 trillion is actually cheaper than our ‘Inaction’ scenario at $192 trillion. This, as we examine in this chapter, is due to the rapidly falling costs of renewables, which combined with lower fuel usage from energy efficiency investments actually result in significantly lower long term fuel bill. Yes, we have to invest more in the early years, but we potentially save later, not to mention the liabilities of climate change that we potentially avoid,” the authors write in their report. ‘Action’ vs ‘Inaction’ scenarios reviewed under the CitiBank report. So, where does all this money coming from? Assuming rapid development of renewable energy tech, like more efficient solar panels, the authors forecast significant energy savings. Then there’s avoided climate change costs, estimated at $50 trillion and $30 trillion were the planet 4.5°C hotter on average or 2.5°C, respectively. Bottom line, investing in decarbonizing the planet lends the best return. Of course, this isn’t the first study which found pro-actively curbing emissions and investing in renewable energy might prove to be more economically viable. The International Environmental Agency also issued a report in 2014 which analyzed how the energy sector might look like 40 years from now. The report concludes the world might save $71 trillion by 2050, which seems to be quite off from the CItiBank analysis. Elsewhere, a new study from REMI finds that a revenue neutral carbon tax could create 2.8 million jobs, increase GDP by $1.3 trillion. It seems like we have all the rational motives to start steadily divesting from fossil fuel (how many of these reports, however, account for the renewable energy storage dilemma? ), but progress is slow. 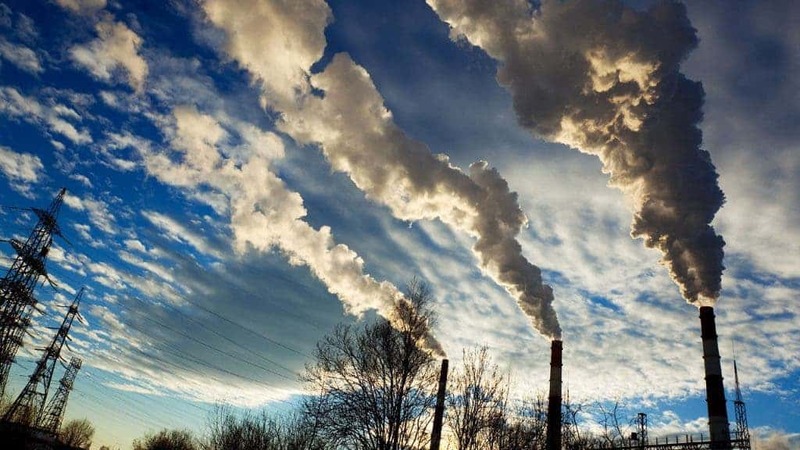 “Some studies suggest that globally a third of oil reserves, half of gas reserves and over 80% of current coal reserves would have to remain unused from 2010 to 2050 in order to have a chance of meeting the 2°C target,” the report mentions. What this means is that – and I’m disappointed to say this – serious progress in curbing global warming might only come when the so-called “green corporations” will be influential enough to cancel the oil&gas lobby. When this happens, we might see some new industrial behemoths dominating the energy markets or, more likely, the same. But it’s hard to recall a time when corporate interests would be so aligned with the public’s.